It was reopened June 18, 2015, with a real yield of 1.142%, 30 basis points higher. That resulted in an adjusted price of $90.59 for about $100.47 of value (figuring in accrued inflation). The unadjusted price was $90.17, meaning this TIPS lost almost 8% of its value in four months. Where does it stand today? Because this TIPS trades on the secondary market, we can get a good estimate of its current value, one week ahead of the auction. Bloomberg’s Current Yields page shows that this TIPS is trading with a real yield of 1.17%, not too far off that June number. The price is quoted at $89.34 for $100 of value. The Wall Street Journal’s Closing Prices page shows this TIPS – which matures 2045 Feb 15 – closed today with a yield of 1.174% and an asked priced of about $89.50. The Treasury’s Real Yields Curve page estimates that a full-term 30-year TIPS closed today with a real yield to maturity of 1.19%. 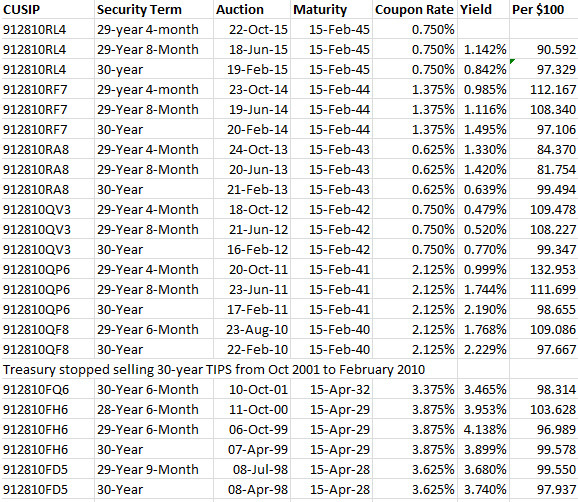 This is in line with the other numbers, since a full-term TIPS should yield higher than one maturing 8 months earlier. The inflation adjustment. Keep in mind that this TIPS will have an inflation index of 1.01213% on Oct. 30, the settlement date. That means investors will be buying an extra 1.2% of inflation adjustment, and that will raise the cost. The auctioned yield remains the same, you will just buy a little extra principal. Prospects. I recommend buying TIPS and holding them to maturity, so if a 30-year TIPS fits into your expected lifespan, this TIPS could be interesting. The coupon rate of 0.750% will mean you won’t be collecting much in cash payments, however. This TIPS is probably best suited to a tax-deferred account. If you are buying as a trader, you can see that a 30-year TIPS is a very volatile investment. Do you think long-term interest rates are peaking? Then this is a buy. If you think they will rise higher, hold off and look at the next 30-year auction, in February 2016. Re your comment on buying maturities that fit within your expected lifetime, my view is that you can add 10 years to your expected lifetime since, at the expiry of your expected lifetime, you (or your heirs) would then have a ten year TIP which is much less volatile. Sam, I would agree with you if I had heirs I am worried about. I don’t. So I would really like my investments to pay off during my expected lifetime. Especially investments that build accrued principal until maturity.